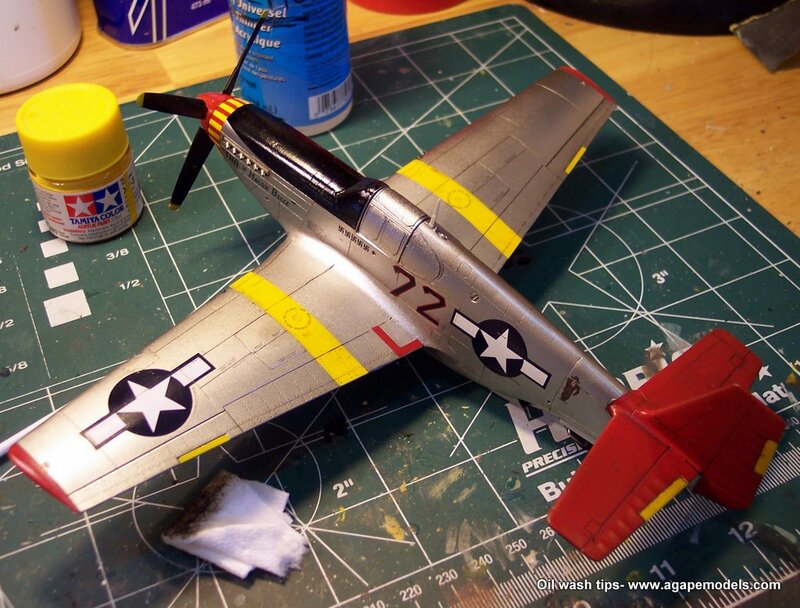 One of the techniques many modelers use to enhance the look of their models, especially aircraft, is a “wash” to enhance panel lines and other detail. There is quite a bit of debate about how realistic this effect is- but I’ll leave that discussion to the various forums. For me personally, it’s a stylistic question. I like the way it looks- plain and simple! 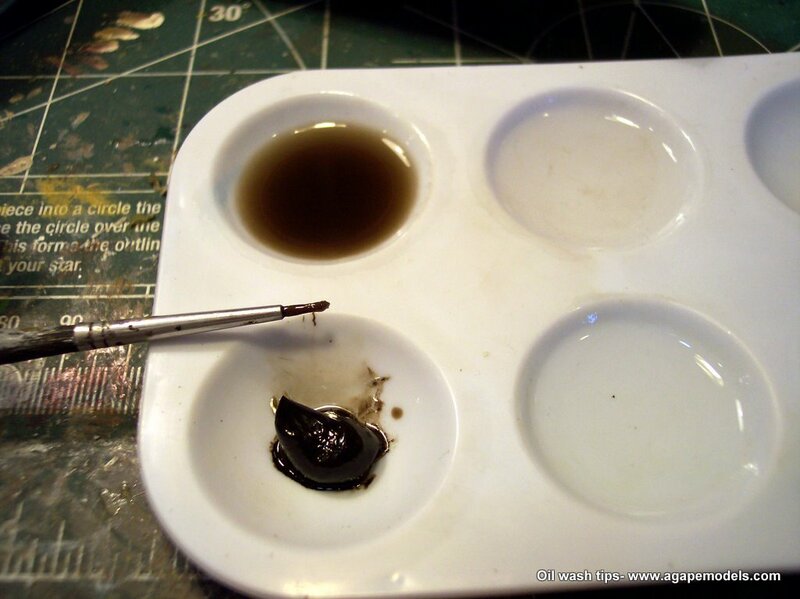 To start with, let’s look at the “tools” I use in doing an oil wash. First, you’ll need a model. 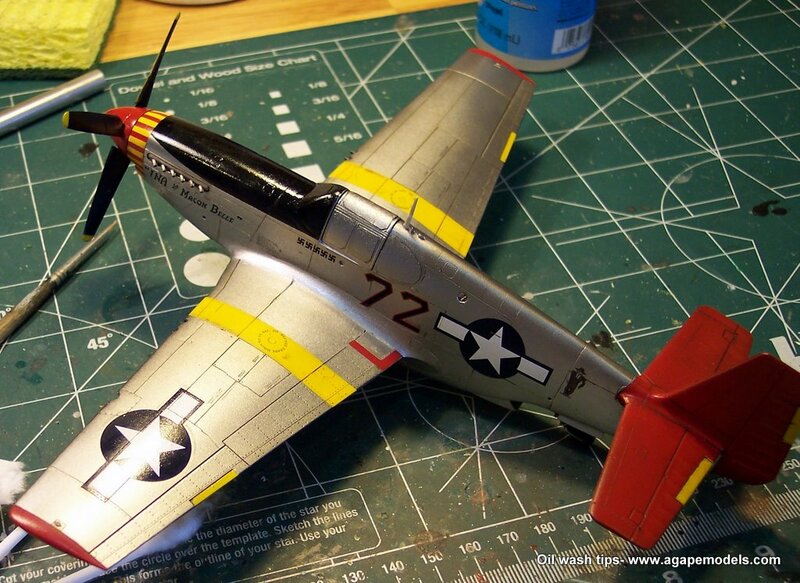 🙂 I’m going to be working on a nearly completed Accurate Miniature’s P-51C. It’s been fully prepped with two coats of Future, and allowed to dry for 24 hours. You’ll want the model’s surface to be fairly smooth. Doesn’t have to be glass smooth, but I generally lightly sand down the paint with a paper coffee filter prior to the pre-decal coat of Future. Then, after decaling, I hit it with two more Future coats, and a final polishing again with the coffee filter. What else do I use? For the oil paint, I like using Windsor and Newton Raw Umber. It’s not as stark as black, but certainly dark enough to work with most finishes. You can get a tube at Hobby Lobby or Michaels with a coupon for just a few dollars, and a larger tube should last quite a long time. I also use odorless turpenoid as my thinner- I picked up mine at Hobby Lobby. I like to use the small mixing palette shown in the picture… you’ll see why in a few more paragraphs. Certainly anything with separate compartments will work, from a piece of foil shaped appropriately, to several drink bottle lids. Whatever you have will work- you just need several spaces to work with. IMPORTANT NOTE: Alert reader Erik Brandlen sent me this note: “Jon, one important note. As there are several brands of turpenoid on the market, it’s important to point out the brand you’re using. I used a different brand (Turpenoid Natural)and it ate through two coats of Future and into the paint, ruining my paint job.” Yow! Erik’s note reminded me that I’d seen a similar report on another modeling forum. I use Weber Odorless Turpenoid, which I purchased from Hobby Lobby. Sounds like the “Natural” types are not good for this type of work. As with any chemical used for modeling applications, always test it on a scrap piece if possible first! Thanks for the heads up, Erik! Finally, some cotton swabs, paper towels and a small brush- I like a “0” brush. I start by putting a glob of oil paint in one tray of the mixing dish- you can see it’s size next to the “0” brush. Then, I put turpenoid in three other trays. One will be the “mixing” tray, one a cleaning tray, and the other will be to keep clean turpenoid in. What I do is use some of the very thin turpenoid to get the panel lines “wet”, so when I use some of the thicker oil from the other tray, it will flow nicely. It may seem like a tedious extra step, but it has worked very well for me. So using the brush, load it up with some wash from tray B, and touch it to your panel line- I tend to start on the outer left wing. Why? I dunno…. I’m left-handed…. maybe that’s it. Let the capillary action draw the turpenoid into the panel line. Repeat until a small section is done, as shown in the picture. 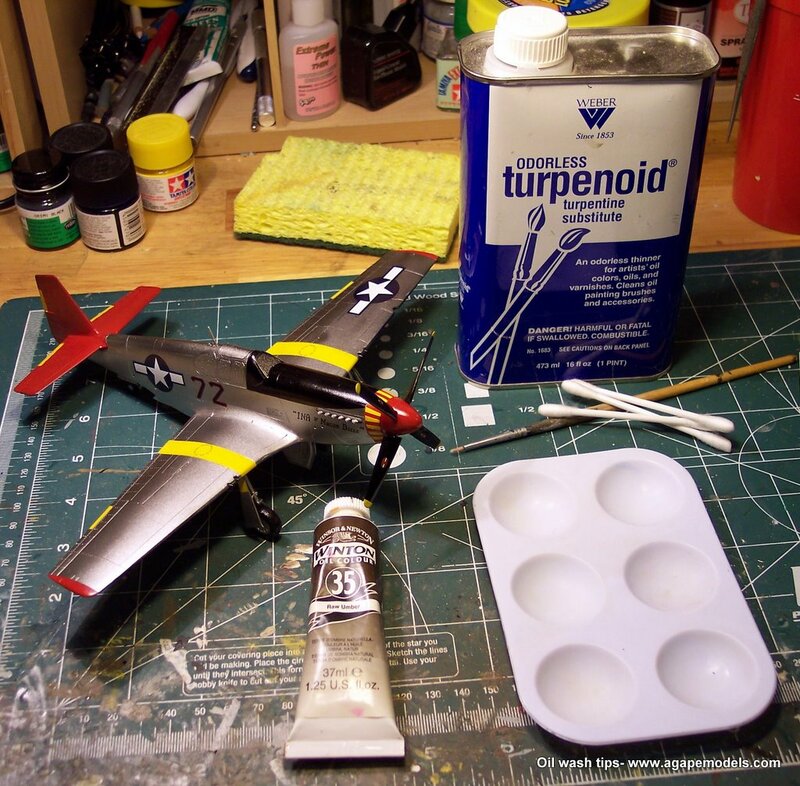 You should end up with a very light wash.
Once you get that wash in, you switch to tray A. Stir the brush lightly in the puddle of turpenoid around the paint blob…. don’t try to mix it, just enough to get some of the oil drawn into the turpenoid. Once the brush is loaded, go back to your panel lines and apply that. The pre-treatment you’ve already done should aid in drawing this thicker color into the pael lines very well. Just lightly tap around to distribute it. It should really start making the panel line start standing out. 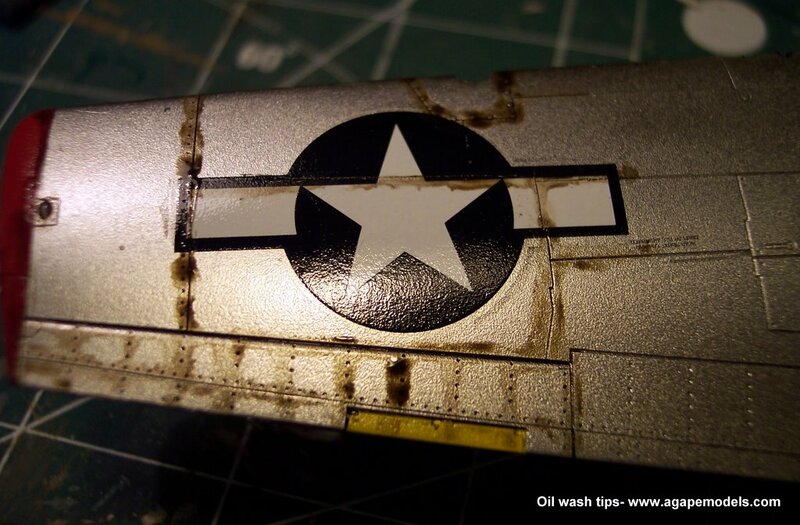 As you’re doing your wash, you’re likely to run into some decals… and they might have panel lines going through them. Here’s how I deal with them. First, make sure you have a reasonably new blade in your knife…. doesn’t have to be brand new, like is recommended for masking canopies. But it does need to be reasonably sharp. 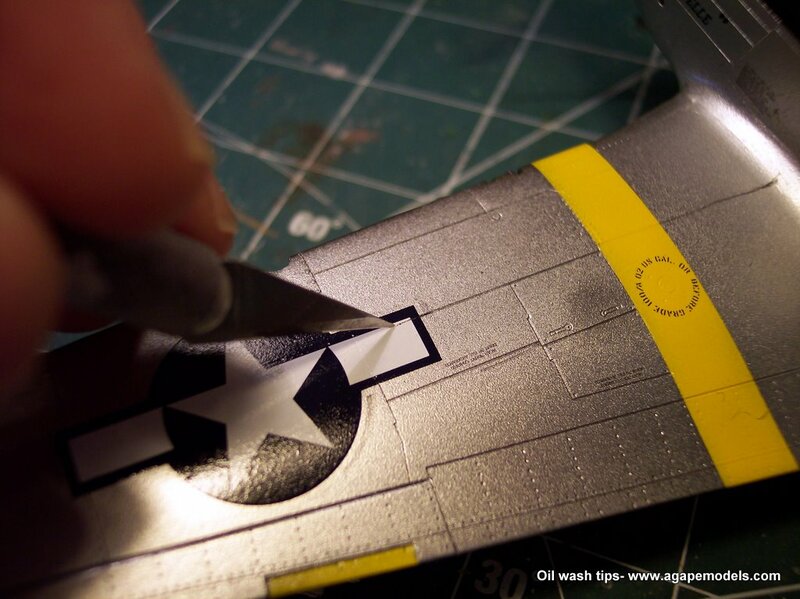 Placing the blade in a panel line, lightly drawing it through the decal. If the decal starts to tear- your kinife is too dull! 🙂 It should cut through the decal though. Do this for all the decals. As you’ve been doing this, you’ll notice the turpenoid in tray A is gettting lower. Never fear…. just pull some over from tray B as needed. 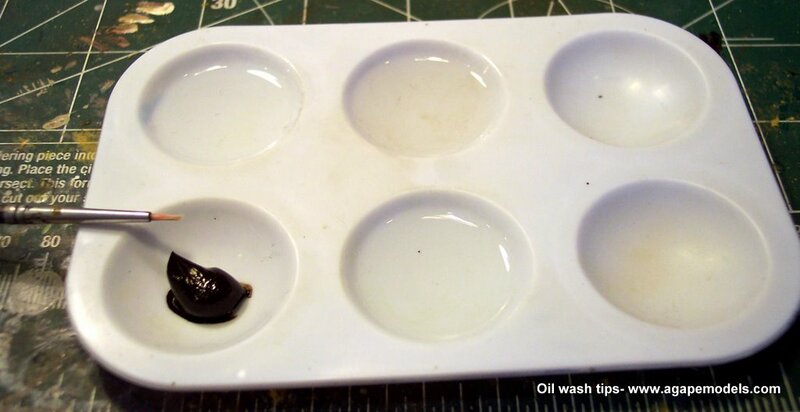 If you get a little too much oil on the brush, use on of the other pools of turpenoid to wash it off. You may find you need to do this periodically, or you can start getting some heavy deposits of oil. Not that it’s a problem- but it can take a while to clean off later. Say you do get a huge blob of oil in one area…. what should you do? While panicing is certainly an option, it’s not really necassary. 🙂 Just get some turpenoid from tray B, and using that, slide the excess oil around to fill in adjacent panel lines. Simply keep doing that until you’ve reduced the excess to a manageable amount. Keep going until you get the whole model completed. Every panel line, top and bottom. Don’t forget gear doors, landing struts…. and detail that needs to be highlighted. So you’ve finished your pizza or BBQ, and you’re ready to move on- what next. Grab a cotton swab. What you do is to wipe parallel to the panel line. 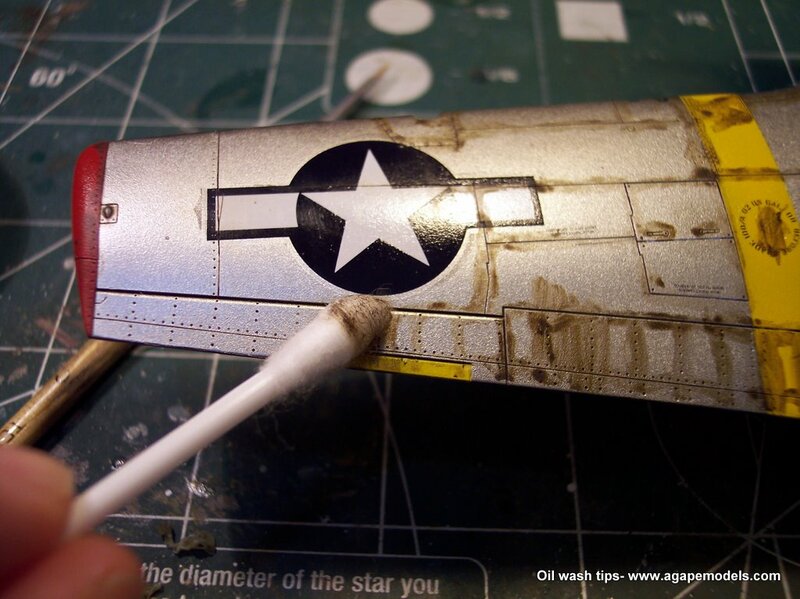 I try to not wipe directly over the panel line with a swab, as it might reach down in the recess and pull the oil up. Continue wiping, removing the majority of the excess outside of the recessed line. 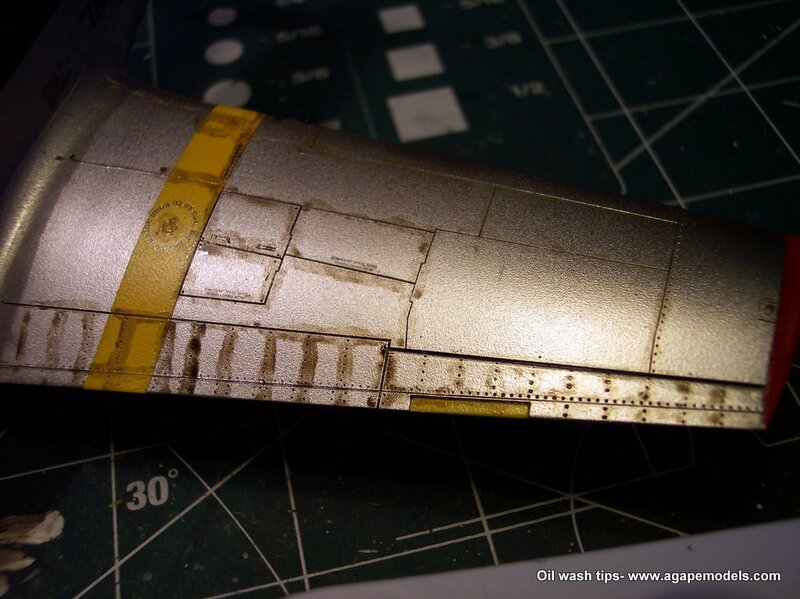 I tend to do a section at a time in this step… a wing, one fuselage side, etc. You’ll need to switch the swab out fairly often, so you’re not just smearing oil everywhere. You’ll likely have a little excess still left, it may just look like a slight brown tint. If it gives it a weathered look you like, you can certainly leave it. However, if you want to remove it, grab a piece of paper towel. Tear off a section that’s 3 or 4 inches square, and fold it down to about a half-inch wide by two inches. fold that in half. Using the “rounded” edge, very lightly begin wiping in the direction of the airflow. You’ll see it removes a fair amount of surface oil. Don’t push down, or you’ll get into the recesses and pull out what you want to keep. 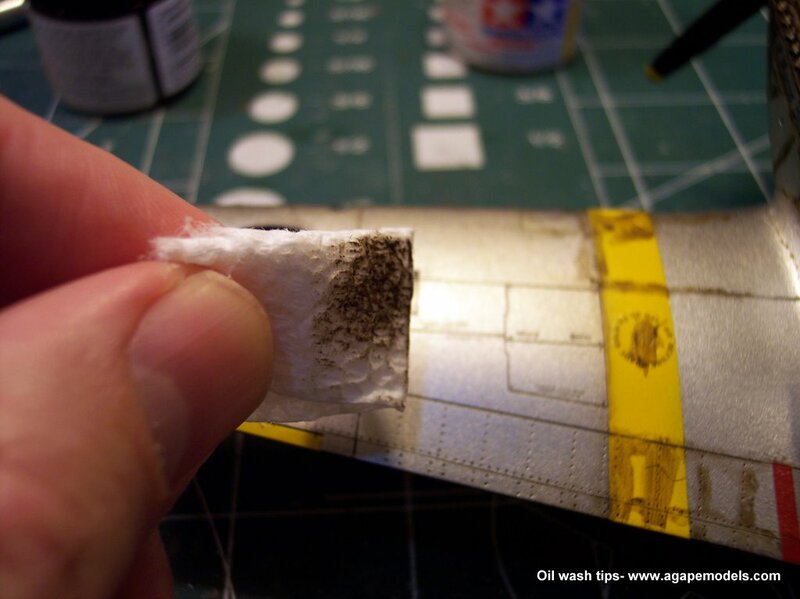 You may run into a section that is a little tougher to wipe off the excess oil. If it’s in an area you can get to it with the paper towel, get just the slightest amount of turpenoid on the paper towel, letting it soak in. You don’t want the towel moist… just the slightest hint of turpenoid. Using that, lightly wipe over the area where there is excess. It should take up the oil in the problem area. If the area is in a tighter space, simply use a cotton swab instead of a paper towel. Once you are done, you may find some areas that the wash didn’t settle in to your liking, or maybe you accidentally wiped it away. To correct these, just go back through the wash procedure in these areas. I tend to give it a little more drying time in an area that had problems, just to make sure the wash stays down. Remove the excess as described previously. 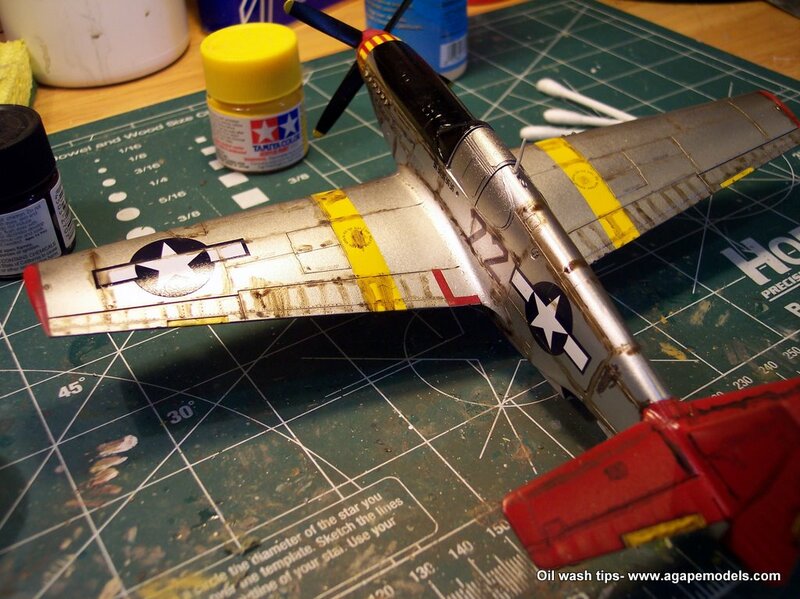 After that- you’re done with the wash. As you can see with the P-51C I have been working on, the oil wash really makes the panel lines stand out. Give the oils at least 24 hours to dry before applying any dull coat. If you have additional finishing to do, you may want to give it as long as a week to dry. Oils take a loooooong time to fully cure. I’ve successfully put a dull coat over them after 24 hours, put when I’ve tried to add other paint or finishing steps, I found that a week was need. Well- I let it sit for a week…. coulda been 72 hours. Or 96. Or 36. 🙂 Experiment….. 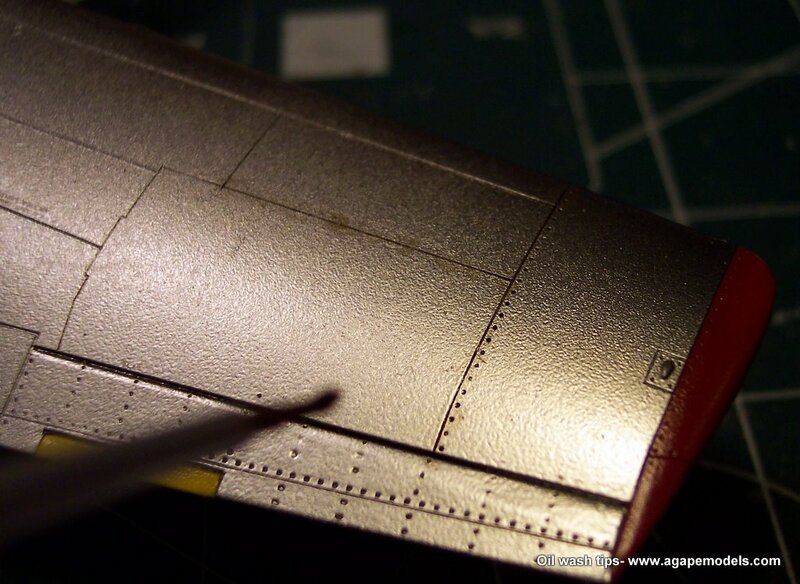 If you’re working on a very dark aircraft… black, blue, etc., try using a shade of gray to highlight panel lines, something that is lighter than the aircraft color. Also, some folks I know prefer to use lighter colors than raw umber on lighter undersides of aircraft. There are certainly other techniques for washes. For a long time I used acrylic washes thinned with water and a few drops of dish soap. This worked fairly well, but dried very fast, and sometimes was a bit more difficult to clean up. I tried artists acrylics too… those worked better, and had slightly longer drying time. But my experience with oils has been that in almost every respect, they work better. The color is much more rich, and turpenoid spreads much better than water…. it really is very “slick” when it comes to maximizing capillary flow. And because it is slower drying, you have much more time to clean up and make adjustments. And with a good coat of Future, you can use oils over enamels (I’ve tried it….). And you can experiment with expanding this technique. 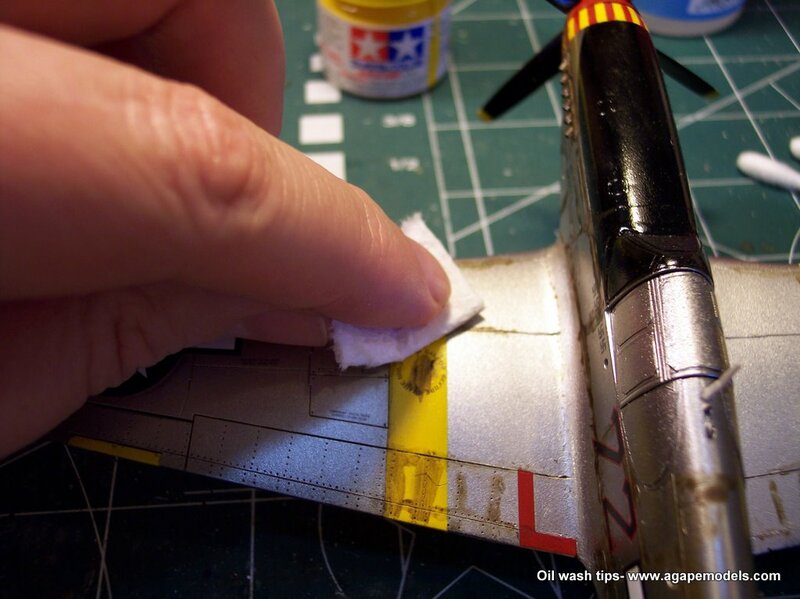 You’ll quickly see how effects such as oil stains, etc., can be applied using minor adjustments to the panel wash technique. The main thing is to have fun- enjoy oiling up those builds! Thanks Jon for the “How To” article on panel line wash. But you failed to mention ‘how to’ make such a great model like this one!! A real show stopper!! I use this technique, except that I just use one “blob”, but I’m game to trying something different. On swabbing up the excess, one thing I have found useful regarding the technique is to roll” the swab as I wipe in order to present a clean swab surface as I’m wiping. Though, this is a personal technique and not necessarily the best approach. Outstanding article Jon. Thank you. You explain your technique in a very straight forward and easy to understand manner that even a slow dude like me can understand. By the way, your Mustang is in the showman class. Well done Jon. Jon, one important note. As there are several brands of turpenoid on the market it’s important point out the brand you’re using. I used a different brand (Turpenoid Natural)and it ate through two coats of Future and into the paint, ruining my paint job. Thanks for the tutorial. I used the technique and it works perfectly. Since I am located in Buenos Aires, Argentina, I wanted to say that I used ALBA turpentine as my thinner and it works good. Please, answer my comment. Thanks, Gabriel. I’m so glad to hear that worked well for you! And thanks for the information regarding the thinner you used, I’m sure others will find that helpful. Thanks for visiting AgapeModels.com, and have a blessed day. Thank you for a very comprehensive tutorial. I’m a novice builder and grand ” master-model-maker” pappy-less. So I’m learning it all on my own. In my town we have a large chapter of the S.U.J.B. ( snooty, unhelpful, jerky builders) brotherhood. Hey Landon, thanks for your kind words! Check your email- I sent you a detailed reply that will hopefully answer your questions. If you didn’t get it, email me directly at jonbius@gmail.com. Thanks! 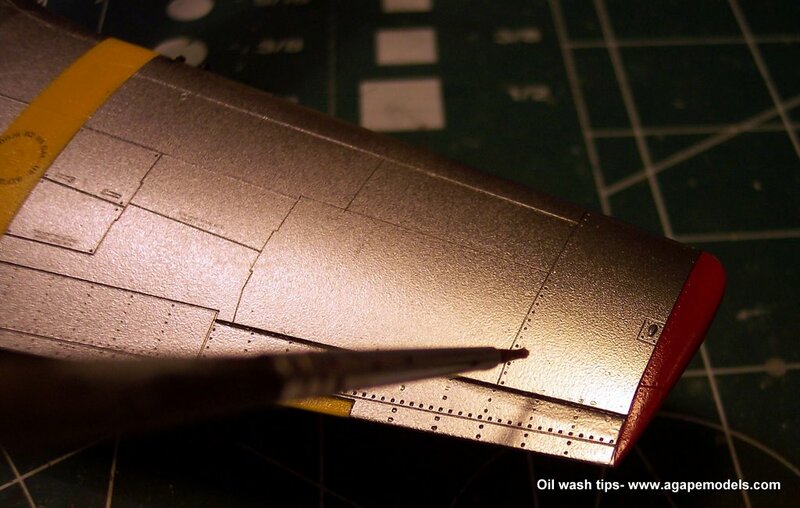 do you really required a light layer of clear coating before you apply the oil wash? is it a must for clear coating? Hi iceman! Thanks for your question. In order for the wash to come off from the areas it needs to be removed from, the underlying surface needs to be smooth. A glosscoat is the easiest way to do that. it also protects the underlying paint from interacting with the wash. I have seen some folks do it directly on the flat paint, to achieve a particular look. But generally the gloss coat step is recommended. Thanks for the reply Jon. Gonna get some top coat. Great article! Iknow this thread is nearly a decade old, but thanks so much for posting. I too have had good experiences using artists oils for weathering and panel lines, but I use ‘white spirit’ available from any arts supply shop. I have applied this over several types of clear coats and have never found it to react adversely. It also helps not to scrub away at a given section for too long! Just start at one end of a wing/ fuselage/ part and work your way along.